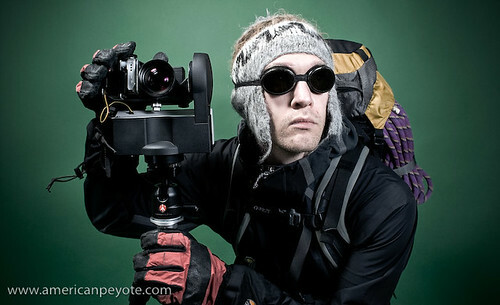 Purpose: Portrait for my review of the GigaPan GigaPan Panoramic Camera Review. The Concept: Mixing together the low and high-tech mountianeering styles, vintage glacier goggles with a handmade Bolivian hat versus the latest in softshell technology and modern mountaineering equipment. Lighting: One Sunpak 383 on boom directly above subject in small softbox. One Contax TLA280 camera right slightly above the subject. One full length silver reflector camera left, angled slightly upwards.